This 'Circus' theme Event was commissioned by the 'Big Dog Polo Club' in Melbourne. This amazing agency (Big Dog Creative) is behind some of Australia's leading Brands and Products. We were delighted to be involved with making this years Werribee Polo Day a raging success...or should I say a 'Heaving' success. 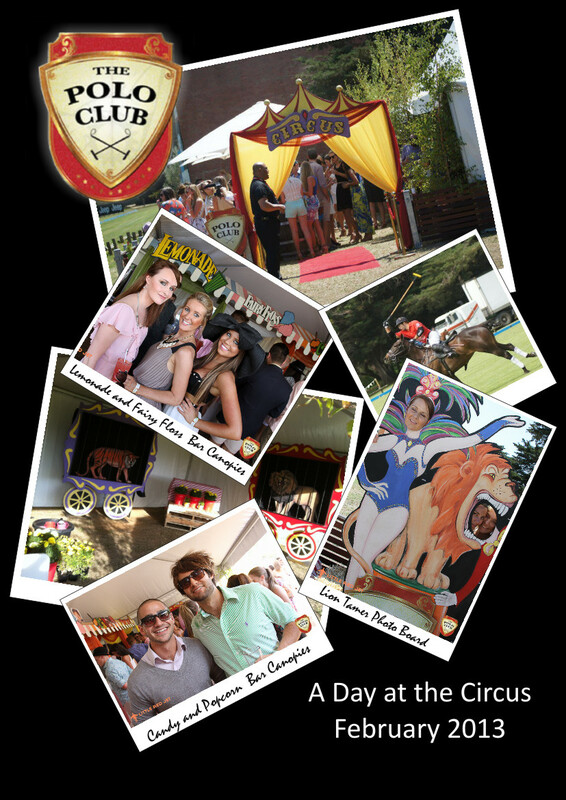 It was just that; a complete sell-out (350 tickets) plus all the visitors from the other side of the field, ensured the 'Big Dog Polo Club' Circus Tent was the place to be on Saturday...nobody knows who won the Polo:)...but a better day could not have been had. Our Circus props have been designed and inspired by the 18th Century Glory Days of the Big Top Circus : a time when the Circus was more important than Disneyland, when it surpassed all other entertainment venues in popularity. 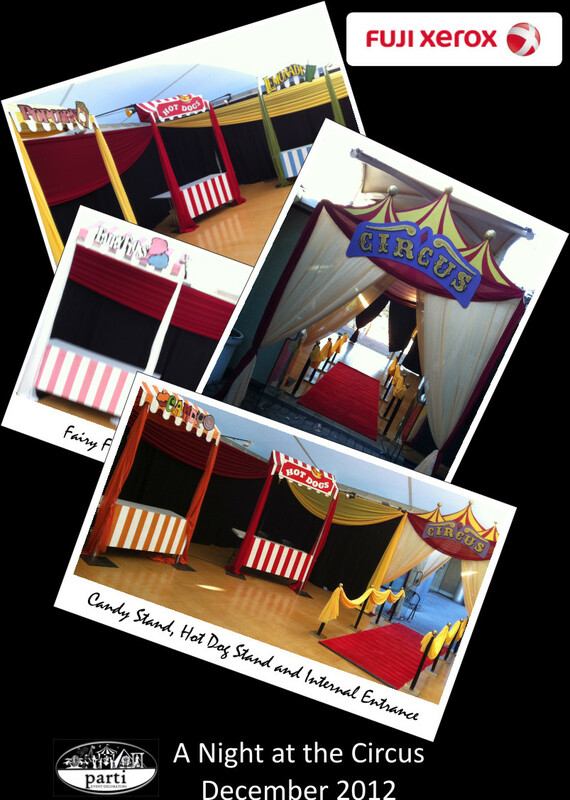 The Circus Entrance creates the perfect first impression for any event. The vivid colours, the opulent draping, the professional yet 'Old style' lettering, Plush Red Carpet Runner and Gold Bollards all combine to create a classy, exciting and inspiring entry...sure to make all your guests feel special and important...a great way to start the day!! These Bar Canopies consist of French Striped Roofing Panels and Skirts, Sign-age and vivid multi-coloured chiffon draping. These custom designed canopies are ideal for Marquees: four Canopies covered the Cocktail Bar in the Central Marquee which is 6mtrs wide, perfect for 4 x 1.5mtr wide Canopies. The Lion Cage is a 2.5 dimensional Prop that consists of a relief style Lion and 18th Century Styled Wagon Cage...again a very colourful prop in keeping with 'Glory Days' of the Circus. The Tiger Cage is a 2.5 dimensional Prop that consists of a relief style Lion and 18th Century Styled Wagon Cage...again a very colourful prop in keeping with 'Glory Days' of the Circus. This prop was hand painted by Margaret Gibson and is a beautifully vivid reproduction of an 19th Century Photo board used in the Side Shows during the Glory Days of the Big Top Circus. Thank fully the weather in Melbourne was beautiful and we were able to utilise both the 'Circus Entrance' and the 'Lion Tamer Photo Board' props outside. Instead of using the steel base plates (our normal MO) we stabilised the props using Star Pickets. Because the Marquee did not have a floor we also used star Picket to support the Bar canopies and the Circus Cages. This Bar Canopy consists of Bamboo Poles, Thatched Roof, Thatched Bar Skirt. These Props are attached to an Aluminium frame and stabilised with steel base plates. Note: extra bracing ropes were used to cater for wind which is a constant element in this fabulous venue. 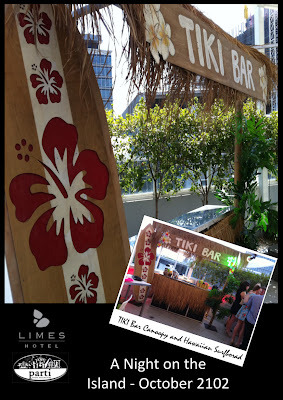 The Tiki Bar Sign is a 1.8mtr Piece of marine ply that has been cut and painted by hand. It is attached to the frame. These Solid Timbre surfboards are 2.4mtrs High and 600mm wide and 20mm thick. The ancient Malibu design is inlaid with Frangiapannies and lacqured to reveal the beautiful grain of the multi level timbre. We always recommend the addition of our synthetic palms fronds to add that extra texture and dimension to our Props. These life size palm frond are approximately .70cm High and 50cm wide. This out door event required 2 x 100Watt Flood Lights to ensure the prop was visble and strongly represented at night. We also used Green and Yellow bulbs to add that tropical feel. This venue is a little tricky when it comes to an installation as the there is only one lift. Fortunately all of the props fit into this lift (so no stair climbing was required), but we are often delayed while guests are are given priority...but this is usually on a problem during the bump-in. Bump-out usually happens late at night or very early in the morning and we have the lift all to ourselves. 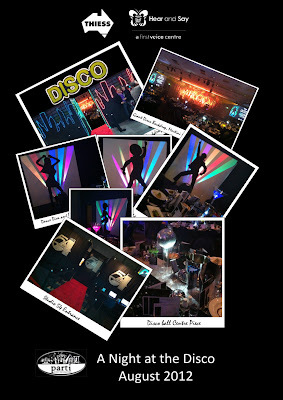 This 'Night at the Disco' Theme Event was commissioned by the Hear and Say Centre - Brisbane for their Annual Charity Ball and was held at the Brisbane Convention and Entertainment Centre(BCEC). As usual Karen Descovich (Events Manager - Hear and Say) wanted to lift the bar on previous events to ensure her very sophisticated following were given a treat. Lots of lighting and bling combined with the by-gone era made eternal by the movie 'Saturday Night Fever'. All our services combined together and made for Hear and Says most successful fundraiser yet!!! We were asked to provide Event Design, Props and Installation. Karen provided us with a Theme and Artwork for the Invitation. 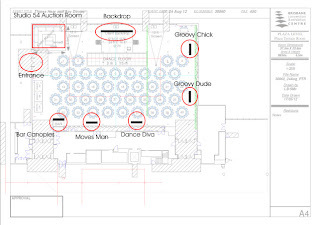 From there we developed Concept Drawings so that she could visualise the Decorating plan.Once the creative was reconciled with the budget we then contacted the BCEC and talk through these elements with the Event Planning Manager: Melissa Nguyen and Senior AV Project Manager: Steven McDonald. This consultative process resulted in Decorating Floor Plan that encompassed all our power and Audio Visual requirements. An event Execution Schedule was developed and shared with all parties. 1 x Rotating Mirror Ball. 20 x Illuminated Giant Martini Glass with Multi-Coloured Acrylic Ice. Installation at the BCEC is always straight forward and with the excellent support from Venue staff just a matter of good preparation and planning. This job required approximately: 48hrs of Preparation, 48hrs Installation(Bump-in) and Warehousing(Bump-out) of 24hrs. Total 120hrs. This 'A Night in Pirate Cove' themed Event was commissioned by Compass Pools, for their 30th Anniversary and was hosted at the Hyatt Sanctuary Cove on the Gold Coast. Unfortunately we still haven't received too many pic's to share but am sure that more will be posted soon. Our client utilised all our services: EVENT DESIGN, PROP HIRE and INSTALLATION. We met with the Compass Pool representatives at the Hyatt Sanctuary Cove and inspected the Room together. We discussed the various options and agreed on the key areas that needed props and which props would be most suitable. During this visit we consulted the Venue staff with regards to Power and Audio Visual requirements, Bump-in and Bump-out times. We then sent the client the Concept drawing for their approval. 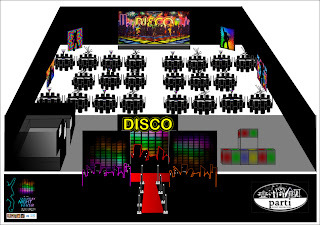 Once this was confirmed we generated a Floor Plan and an Execution Schedule and distributed this to both the client and the venue. 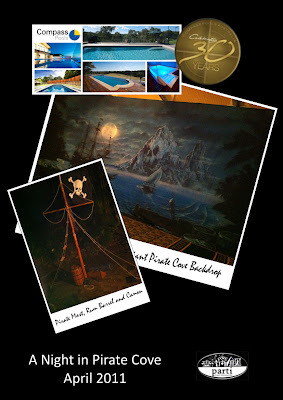 The event prop list included: 3 x Pirate Ships Masts with Jolly Roger Pirate Flags, 3 x Rum Barrels, 3 x Ships Canon's, 3 x Canon Ball Clusters. 2 x Treasure Chests and 1 x Giant Pirate Cove Backdrop. Our installation team picked the Props up from the NQX Depot at Nerang early in the morning and had completed the Bump-in by 12.00pm. This 'Night at the Circus' Themed Event was commissioned by the Jones Retail Group for their Annual Christmas party and was held at the Redland's Cultural Centre in Brisbane. The fabulously dressed guests were welcomed and photographed in front of our equally fabulous Circus Entrance Prop complete with Plush Red Carpet Runner, Gold Topped Bollards, Circus Sign, Turrets and Lashings of Red and Yellow chiffon...memories for a life time. Awaiting inside were Popcorn and Hotdog stand props so lavishly stocked it could only be an IGA Christmas party! 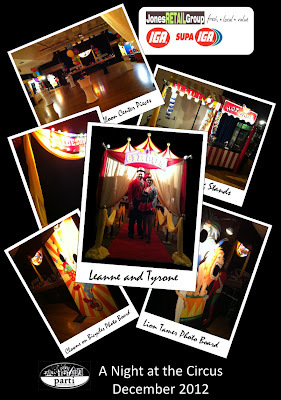 Surrounding the room (filled with Vivid Multicoured, Spotted Helium balloons) were our Lion Tamer Photo Board, Clowns on Bicycles Photo Board, and Illuminated Side Show Alley Sign Props. Last but not least were a series of Red and Yellow Uplights and our dynamic Red and Yellow search lights. Leane and Tyronne, thank you again for choosing PARTI to theme another of your fabulous parties, I'm sure you have the happiest team in the business. 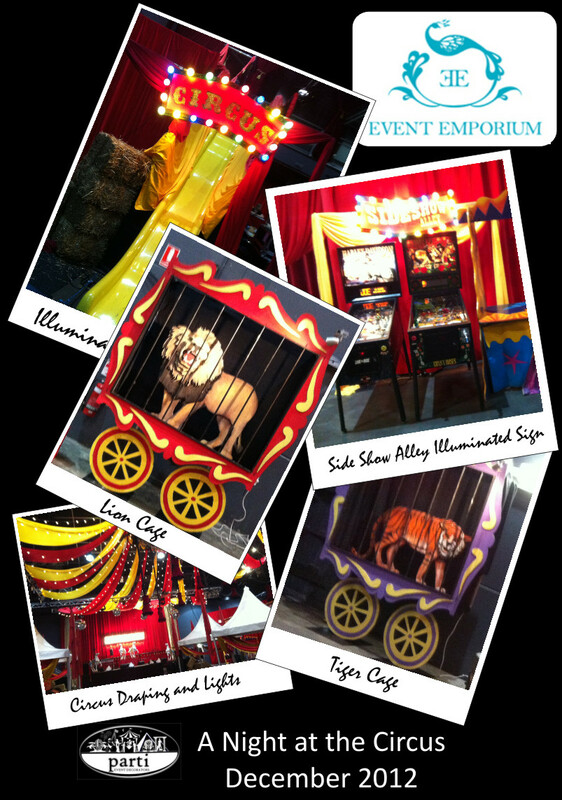 This 'Night at the Circus' theme event was commissioned by the Event Emporium for a large corporate Christmas Party held at the Big Top - Luna Park - Sydney. We were delighted to be part of the celebration which included our Illuminated Circus Sign, Illuminated Side Show Alley Sign, Red and Yellow Circus Draping, Lion Cage, Tiger Cage, Fairy Floss and Popcorn Bar Canopies. The guys at the Event Emporium showed amazing vision and were great to work with. See again real soon. This 'Night at the Circus' themed event was commissioned by Xerox Fuji Australia for three events that took place at their head office in Sydney. It was initially used for the annual presentation of their Undergraduate Research Projects. Each Undergrad was allocated a Stall; there were two of each: Lemonade, Hot Dog, Popcorn, Candy and Fairy Floss and two photo boards (Lion Tamer, and Clowns on Bicycles) flanked the exhibits of 2 other presenters. That evening the room was converted into a Cocktail Bar and Dining Room (Half of the Huts were turned into Buffet Tables and half were utilised as Beverage Bars). to celebrate the success of the graduates. On the following night the room was also venue to the Fuji Xerox Christmas party. In addition to the Bar canopies the room was fully lined with Black Curtains (to mask the existing infrastructure) and draped with Yellow and Red Chiffon.The venue was complimented with our Circus Entrance (a fabulous backdrop for some very memorable photo's of staff, graduates, colleagues and suppliers). Last but not least four search red and yellow lights traversed the white ceiling to add that big top feel and a very important dynamic element. Thanks again Margaret-Anne we love doing work for you and the Team:). Click to visit main site! Parti- Event Decorators. Awesome Inc. theme. Powered by Blogger.